Saranporn Langkulgasettrin put herself in position to capture her third title of the China LPGA Tour season by firing a 6-under 66 to take a one-shot lead at the Beijing Heritage. Thailand's Saranporn Langkulgasettrin in action during the second round of the BridgeCC CLPGA Beijing Heritage at the Beijing Orient Tianxing Country Club in the Chinese capital on August 17, 2017. Saranporn Langkulgasettrin put herself in position to claim her third win of the China LPGA Tour season on Thursday when the Thai teenager carded a 6-under-par 66 to take a one-shot lead through two rounds of the BridgeCC CLPGA Beijing Heritage. The 17-year-old was at 9-under 135 at the Beijing Orient Tianxing Country Club. Singaporean rookie pro Amanda Tan was second after a 69, while Chinese amateur Wang Xinying was three shots off the pace after posting her second consecutive round of 69 at the 200,000-yuan (US$30,000) tournament. Overnight leader Piyathida Ployumsri (73) was equal fourth, tied with fellow Thai Tiranan Yoopan (69) at four shots back. Saranporn, winner of the Zhuhai and Wuhan legs, carded a bogey-free round with six birdies, including one at the last, a 474-yard par-5, to take the outright lead. “I feel good today, I feel really good with my shots. I'll do my best tomorrow and won't think too much about being the champion. Tomorrow I am going to play with my friend (Tan), so a little bit of pressure but it will be fun,” said the Phuket native. Saranporn, a winner of 11 pro tournaments, expressed her appreciation for the Heritage series. 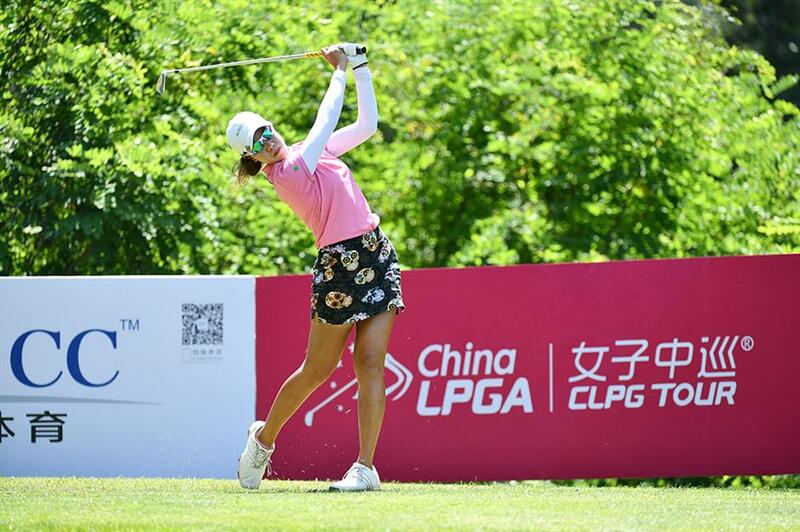 The tournaments were introduced to the China LPGA Tour calendar this summer and feature low-purse events that are designed to give young pros and amateurs more competition experience. Tan, an 18-year-old product of the Sentosa Golf Club, turned it on towards the end of her round with three consecutive birdies starting at the 15th hole to keep in the hunt for her maiden title. “Today the start is not is very good, not as good as yesterday. I came back on the last four holes but my iron play I struggled a little,” said the teenager who turned pro in February. Wang Xinying, an 18-year-old from Beijng, is playing China LPGA Tour events and others around Asia during her summer break from studying at the famed Duke University in North Carolina. Her round today included five birdies and two bogeys.